The newest addition to our Glacier Snow Guard family offers the same advantages of the Standard Glacier Snow Guard as well as fit in narrow passages. Where could the Mini Glacier Snow Guard be utilized? In small areas and overhangs where the larger Snow Guard is not practical. Made from Lexan material to provide UV Protection, Superior Strength and Optimum Durability. Low Price helps stay within budget. 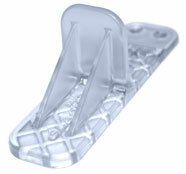 Narrow footprint enables the MINI Glacier Snow Guard to fit where larger Snow Guards won't. Designed for overhangs and narrow valleys found on typical rooftops.